The field study has been established on November 2014 at the Experimental Station of INTA at Oliveros (Santa Fe, Argentina) (Table 1). 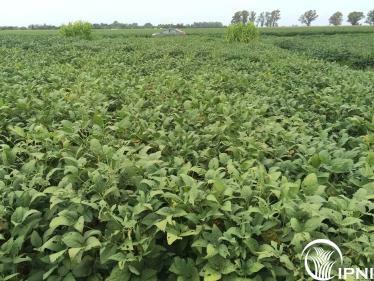 The factors under study are: soybean maturity group, row spacing, planting date, and nutrient management (inoculation, P rate and time, S rate, B and Zn rates, N rate, placement, and time). Table 1. Treatments at the EEA INTA Oliveros site. Argentina, 2014/15 season. Biological N fixation will be determined using the 15N abundance method. “Rescue” irrigation was not needed. Plots were harvested on mid-April, preliminary data is shown in Table 2. Table 2. Grain yield, seed weight and seeds per m2 for the four treatments evaluated at Oliveros (Santa Fe, Argentina). 2014/15 season. On average, the four agronomic management and fertilization strategies yielded higher than 5200 kg ha-1, there were no significant differences among treatments or interaction effects of management practices and fertilization strategies. Intensive management (average of PI and CF+PI) increased the number of grains per m-2 respect to standard management (average of FP and CF) (P <0.01) by 14.5%. Nutritional management had no significant effect (P> 0.60) in this component. Grain weight increased by 4% in response to intensive fertilization (average of CF and CF+PI) compared to standard nutrient management (average of FP and PI) (P <0.04). However, standard practices (average of FP and CF) increased individual grain weight by 13.5% compared to intensive management (average of PI and CF+PI) (P <0.001). In summary, increases of 14% in the number of grains per effect of intensive management practices were offset by an increase of 13.5% in grain weight in the standard management. Comprehensive fertilization tended to increase grain yields but these increases were not statistically significant (+204 to 292 kg/ha). A more detailed report will be available in the next months.